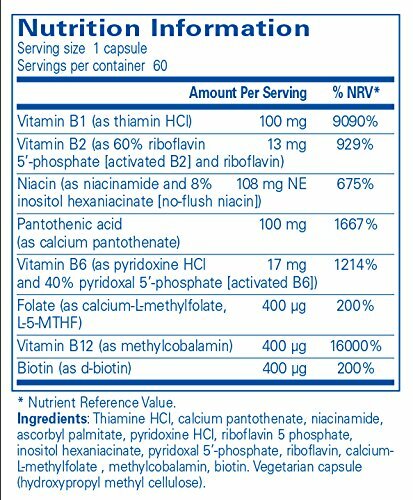 Pure Encapsulations – B-Complex Plus – Balanced B Vitamin Formula With Active Folate – 60 Capsules. B-Complex Plus offers a comprehensive blend of B vitamins packed into one easy-to-take supplement. Includes active forms of B vitamins, including pyridoxal-5-phosphate, riboflavin-5-phosphate and folate as 5-methyltetrahydrofolate (5-MTHF), the universally metabolized and biologically active form of folate. Vitamins B1, B3, and B6 contribute to normal functioning of the nervous system. Folate, vitamin B5 and B12 contribute to the reduction of tiredness and fatigue. PURE INGREDIENTS: Pure Encapsulations® products are made using hypoallergenic ingredients, are scientifically validated by third-party laboratories and are designed to deliver predictable results. FREE FROM: All Pure Encapsulations products are free-from wheat and gluten, egg, peanuts, trans fats and hydrogenated oils, GMOs, magnesium stearate, titanium dioxide, carrageenan, coatings and shellacs, artificial colors, flavors and sweeteners, unnecessary binders, fillers and preservatives.